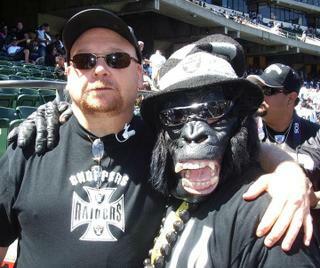 My cousin (pictured here, he's the one on the left) and I were among those proudly in attendance at the Raider Nation Celebration on August 28. It was a gathering of the true faithful, there to pay homage to the past and salute the future of the Raider Nation. Can you feel it? The autumn wind is blowing, friends. Randy Moss is in the building. Big Al is going vertical. It's time for Raiders football!